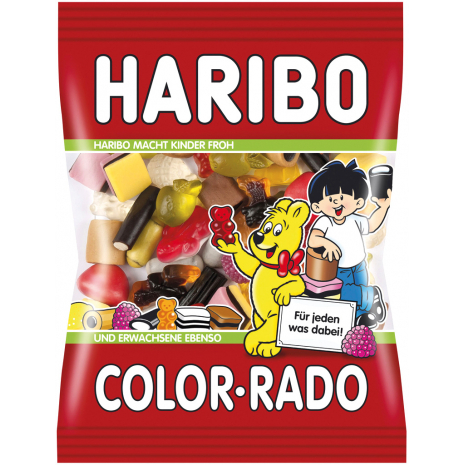 Color-Rado is by far the most popular and versatile mix from the Haribo product range. Contains licorice. Color-Rado is by far the most popular and versatile mix from the Haribo product range and can not be missing at any party! There is a little bit for everyone – from regular gummies, to marshmallow-gummy combinations, to meringue gummies, to licorice... Yum-Yum! Ideal for all candy and gummy lovers. Glucose syrup, sugar, brown sugar syrup, WHEAT FLOUR, dextrose, gelatin, LACTOSE, starch, palm fat, grated coconut, licorice extract (3% based on the proportion of licorice), acidulant: citric acid, SKIMMED MILK POWDER, fruit juice from fruit juice concentrate: apple, strawberry, lemon, raspberry, orange, pineapple, flavoring, fat-reduced cocoa powder, salt, fruit and vegetable concentrates: safflower, apple, paprika, beetroot, carrot, spirulina, sweet potato, elderberry, black currant, lemon, orange, tomato, radish, pumpkin, blueberry, kiwi, hibiscus, chokeberry, mango, grape, passion fruit, caramel syrup, gelling agent: agar-agar, elderberry extract, glazing agents: beeswax white and yellow, carnauba wax, anti-caking agent: talcum powder, invert sugar syrup. Glukosesirup, Zucker, brauner Zuckersirup, WEIZENMEHL, Dextrose, Gelatine, MILCHZUCKER, Stärke, Palmfett, Kokosraspeln, Süßholzextrakt (3% bezogen auf den Lakritzanteil), Säuerungsmittel: Citronensäure, MAGERMILCHPULVER, Fruchtsaft aus Fruchtsaftkonzentrat: Apfel, Erdbeere, Zitrone, Himbeere, Orange, Ananas, Aroma, fettarmes Kakaopulver, Kochsalz, Frucht- und Pflanzenkonzentrate: Saflor, Apfel, Paprika, Rote Beete, Karotte, Spirulina, Süßkartoffel, Holunderbeere, Schwarze Johannisbeere, Zitrone, Orange, Tomate, Rettich, Kürbis, Heidelbeere, Kiwi, Hibiskus, Aronia, Mango, Traube, Passionsfrucht, Karamellsirup, Geliermittel: Agar-Agar, Holunderbeerextrakt, Überzugsmittel: Bienenwachs weiß und gelb, Carnaubawachs, Trennmittel: Talkum, Invertzuckersirup.